“It Will Never Happen Here” – Sexual Misconduct: On Sunday, February 10, 2019 the Houston (TX) Chronicle published a multi-part investigative report on sexual abuse and abusers in the Southern Baptist Convention. Here is a link to their stories — https://www.houstonchronicle.com/local/investigations/abuse-of-faith/. Additionally, they are asking others who have a story of sexual abuse to come forward. This means the story will go on for weeks or months — perhaps years. As with all sin, sexual abuse – particularly of minors – is sad and destructive of people, families, churches, denominations and most important our witness for Christ. As church leaders we cannot ignore this issue. We also cannot fail to equip ourselves to appropriately address this issue and bring to our congregations the appropriate resources and people needed to address this issue. The issue of sexual abuse is not new to our denomination, as it is not new to virtually every other denomination. It is a particularly difficult issue to address for many reasons. Some of these reasons deal with our polity and governance as Baptists, some with our desire to ignore this issue, some with our ignorance on how to address this issue, and some with our lack of courage to address this issue. Many among us have stories of how sexual abuse divides churches, ruins ministries, and destroys the Christian witness in our communities and the world. A defensive stance on sexual abuse is not helpful. A proactive stance is essential. Numerous resources are available to help educate us on issues and procedures surrounding sexual abuse. One beginning point is to go to the SBC.net site to a section entitled “Resources for Sexual Abuse Prevention.” The link is http://www.sbc.net/churchresources/sexabuseprevention.asp. Russell Moore, president of the Ethics and Religious Liberty Commission, SBC wrote a powerful response to the Houston Chronicle article. It may be found at this link: https://www.russellmoore.com/category/topics/abuse/. 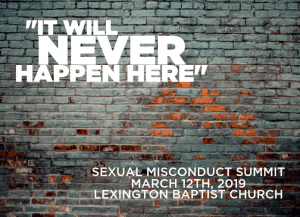 Our state convention – SCBC – is sponsoring on Tuesday, March 12th a sexual misconduct summit – “It Will Never Happen Here.” It is being held at Lexington Baptist Church, 9:00 a.m. to 4:00 p.m. To register go to this link: https://secure-q.net/EventQ/Event?OrgID=SCBCEvents1&EventID=4362. It would be good to have three people from your congregation to attend so that they can report back to appropriate groups in our congregation what you learn. I will be attending and look forward to seeing many of you there.